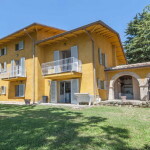 Various possibilities for this Tuscan farmhouse property for sale on the hills of Val d’Orcia. 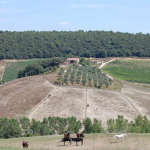 Luxury Tuscan home and farm with vineyards, olive groves, lavender, honey, truffles, small quarry, wellness centre with Hamman plus a swimming pool or maybe also use for a retreat or Tuscan farmhouse bed and breakfast and tourist activity. The choice is yours. 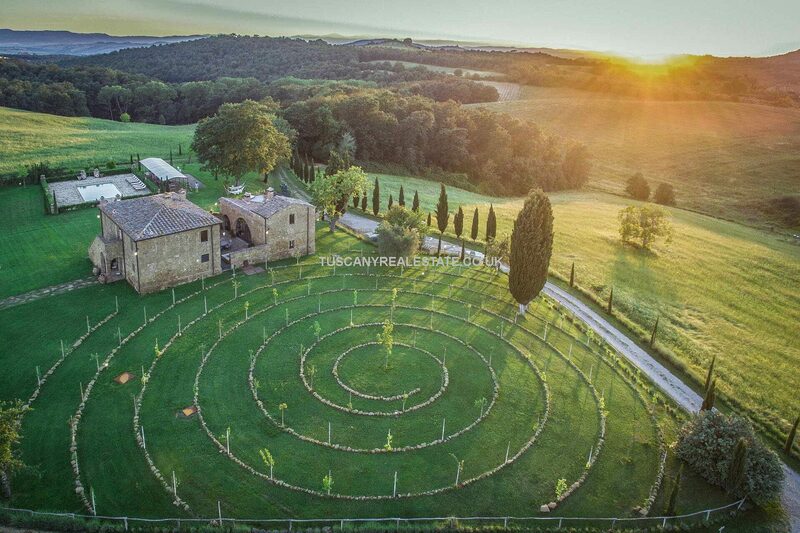 Beautifully restored property near to Pienza with 37 hectares of land which are organically exploited and include a vineyard (3.3 ha – expandable), an olive grove (9 ha), a fruit orchard and a truffle ground, all inside a wildlife hunting reserve. Located on the top of a hill with a unique view over the surrounding Tuscan countryside, the farmhouse is not isolated, easily reached and has excellent privacy. The main farmhouse (254 sqm – 2,733 sqft) is laid out over two floors which, even though linked with an internal staircase, can be independently accessed from the outside. – First floor: living room with fireplace, double bedroom with en-suite bathroom, twin bedroom with en-suite bathroom, closet and service bathroom. – First floor: hammam and shower. An underground warehouse (100 sqm – 1,076 sqft) is currently used as a depot and garage but could be easily converted into a cellar to exploit the vineyard planted in the property or reused for additional cubage to expand the existing buildings. The farmhouse dates back to the 19th century and is a typical stone building. What makes the farmhouse’s of the Tuscan countryside around Pienza stand out is the presence of a courtyard between the two bodies of the property. The buildings have been carefully restored to preserve their original look, both outside and inside. The main building, once the farmer’s residence, is still used as a private residence and boasts all the features of countryside buildings: original terracotta floors, wooden beams, wooden fixtures and arches. The second body was formerly a barn and has been converted into a wellness centre with yoga hall and gym while maintaining a traditional typical look. The farmhouse is located right at the centre of its 37 hectares of land, organically exploited and included in a wildlife hunting reserve. Surrounding the farmhouse there is a 3,000 sqm garden housing the 12 x 6 m swimming pool, surrounded by hedges and fitted with a 220 sqm solarium paved in stone next to a pergola equipped with a BBQ area. The arable portion (13.9 ha) covers the majority of the land and consists of melliferous plants – suitable for honey production (cared for by an external beekeeper). There is also a lavender field (lavandula angustifolia) used for the production of essential oils and a section of quarriable stone which could be used for private works inside the property. The woodland (9.7 ha) is mostly made up of coppice woods (part of which is old enough to be cut down and harvested) and hosts a private mushroom and white truffle (Tuber magnatum) ground. Burgundy truffle (Tuber uncinatum, Tuber aestivum, Tuber melanosporum) can be found not far from the buildings. The olive grove (9 ha) is split into two sections based on the age of the trees. The older grove is made up of 512 trees planted in 1986, while the younger grove is made up of 1,844 trees planted in 2017. As of now, both groves are registered as Toscano IGP, but the newer one could be certified and registered as Terre di Siena DOP. Currently, yearly production ranges around 50 quintals of olives (approximately 800 liters of extra virgin oil). When at full production, the grove could produce up to 300 quintals of olives (approximately 5,000 liters of extra virgin oil). Finally, the vineyard (3.3 ha) is registered as Chianti DOCG (2 ha ♦) and Rosso Toscano IGT (1.3 ha ♦). Cultivated vines are Sangiovese, Canaiolo, Colorino, Ciliegiolo and Malvasia Nera trained with Guyot. 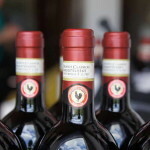 Yearly production ranges around 200 quintals of grapes, meaning 140 hectoliters of wine are produced by a cellar in Montepulciano. It has already been approved the plantation (starting November 2018) of 2.7 hectares of additional IGT vineyard with Malbec, Tempranillo, Merlot and Carménère vines. In this case, once at full production, yearly production could increase up to 360 quintals of grapes (approximately 250 hl of wine).